I measured a selection of these pants and found the waist size of the pants to measure out consistently at 2” larger than the stated size. Most men’s jeans will be sized this way these days…. it’s called vanity sizing. We recommend you measure your waist or the waistband of your favorite jeans and use the chart below to see what size pants you need. Most people will choose the same size they wear in regular men’s jeans. The waist sizes for each pant size can be adjusted down by 2 to 3 inches with the side waist adjusters. Inseam on the regular size pants is about 33” and the inseam on the tall sizes are about 35”. Here is the chart I put together to show you how each pant size measures out so you can select the size based upon what you come up with when you measure yourself. Klim has updated the styling of their Mojave pants for 2019. The previous version of these pants was our best selling pants in their line. These are billed as “off road” pants, but they are a ruggedly constructed pants with mesh panels for full flow air in summer, and judging by our past sales, I think people are choosing the Mojave pant for all kinds of riding. The Mojave for 2019 is offered in two versions… the “over the boot” version you see here and there is also an “in the boot” version too (take the link below to view the ITB pant). ITB riders will be tucking the pant leg into their boots so the leg is made with lighter materials and is tapered to the ankle. The “OTB” pant works over any type boot. The pant legs are wide enough for even the bulkiest boots, but Velcro adjustment is provided at the ends of the legs to make them work with any style boot. These pants will work great in hot weather. Most of the front and some of the back is black mesh material that allows air to flow freely through the pant. There are also many panels in the pant that are four-way stretch materials that really makes these pants flexible and comfortable to wear (in the pictures, the flex panels are above the knee, in the crotch and on the back sides of the knee and thigh). 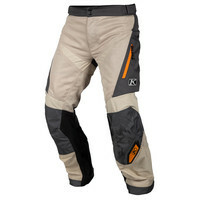 The leg design of the pant is made special for off road riders. The insides of the legs that will be against your bike are fitted with black leather. The leather is durable, heat resistant and helps you grip the bike parts with your legs. And the lower legs of the OTB version have an extra layer of solid textile material behind the black leather which will increase the life of the pant where it gets the most wear. These OTB pants are fitted with pockets so you can add armor in both the hips and knees. If you are wearing your own armor under or over the pants (common for off-road riders), you won’t need it, but for adventure riding or just street riding and you may want to add it. Just take the links below to add the armor. Both CE level 1 and 2 units are available. Pockets for optional armor are not included in the ITB pants since those will likely be used by off-road riders with their own protective equipment. Two pockets are fitted in the thigh area so you can store your stuff and those zip close to keep the contents in. The waist has a wide comfort lined waistband and on each side of the waist, there are adjuster tabs (discussed in the sizing advice above). Large reflective panels are included on the sides of the lower legs of the OTB version. Klim says: Our full-time ventilated off-road chassis is now better than ever. An all-new streamlined chassis incorporates maximum airflow mesh materials to keep you cool as the temperatures rise. Engineered with highly abrasion resistant 840D CORDURA® fabric (developed in partnership with CORDURA®) in the highest wear areas and high-airflow mesh materials everywhere else. If you’re looking for all-day comfort and aggressive riding durability, the Mojave Pant is the ultimate off-road choice.